If you're not having fun, you're doing something wrong. The entire point of undertaking a long-distance motorcycle trip is to test yourself; you're obviously out of your element. If you don't shoot for anything, you can't miss. This might be one of the most valuable lessons I have learned on the Great Ride Forward. When you attempt to undertake a several thousand kilometer motorcycle journey through a series of foreign countries, it is best to adopt an attitude of extreme indifference. No matter what you plan for and anticipate, it is just a fact that nothing will follow accordingly. Neither Peter nor I have ever done a trip like this, and before we bought the bikes in August, Peter hadn't even ridden a motorcycle. As of this writing, we have been on the road for over a month. The plan ever since the beginning of our trip was nonexistent: we purposefully refused to have a plan, because hey... it's not a vacation if you can't take it easy. Despite our laid-back attitude, we found ourselves with deadlines almost immediately. Of course, this was out of necessity, since trains, visa officers and logistics companies don't work on your time. And along with the plans came goals. And along with the goals came heart-shattering disappointment and long, hard cries leaning against the tile wall in the shower. Schedules should be rough guidelines, not certain deadlines. Your most memorable moments will be the ones that were never anticipated, from breaking down at the side of the road and hitch-hiking with your bike to getting a beautiful picture of the scenery that you would've missed if crashing hadn't forced you to stop. The importance of taking your time cannot be stressed enough. The scenery always looks better during the day and you will remember the amazing views long after you forget the leg-numbing 12 hour days spent rushing from one place to the next. Make sure you pick up some good maps, but then again those aren't that important, either. Getting lost is fun. Do bring a compass, though. Never forget Murphy's Law, because everything will go wrong at the worst possible moment. When planning your trip, be sure to take this into account by adding an additional 30% to the expected duration. 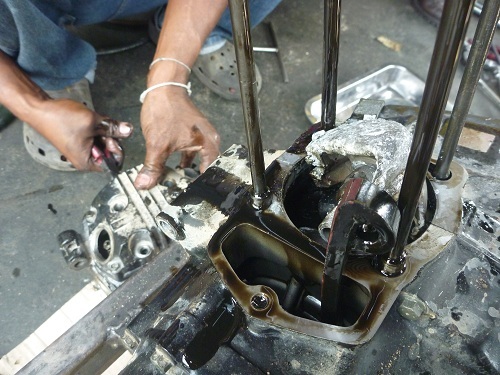 Example: Waking up early to make time on the way to Patong in south Thailand, my piston exploded into a million pieces after 200 kilometers or so. We had to hitch-hike with the bike for the rest of the day after spending 2 hours diagnosing the issue at the side of the road. The result was then having to relax on the beach for a week while the engine was rebuilt. If you want it done right, you better do it yourself (or at least double-check it with/after the 'expert'). It definitely pays to know a little bit about servicing your own motorcycle, even if your knowledge is rudimentary. 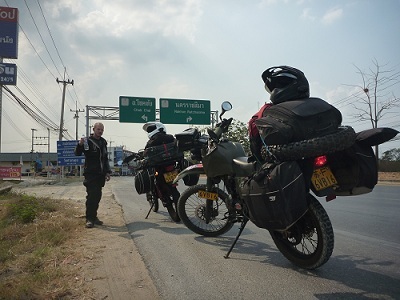 Example: Just before tip #2, we had our bikes in a shop in Bangkok for 3 days for "full-service and safety checks." Turns out they didn't change the oil (or check anything really...), I took their word that the maintenance was completed, and thus an exploded cylinder is now our problem. Seriously: What a horrible city. The first night we got there we got a knife pulled on us by a crazy-eyed tuk-tuk driver and the last night there we were scammed into a $80 bowl of Tom Yum. Bad times. Take care of your body. And also maybe duct-tape a pillow onto your seat. Example: After laying the bikes down and injuring our knees, we went inner-tubing in Vang Vieng before going on a 3-day zipline tour of the Lao jungle. Probably not the best idea. Make sure you are staying hydrated. 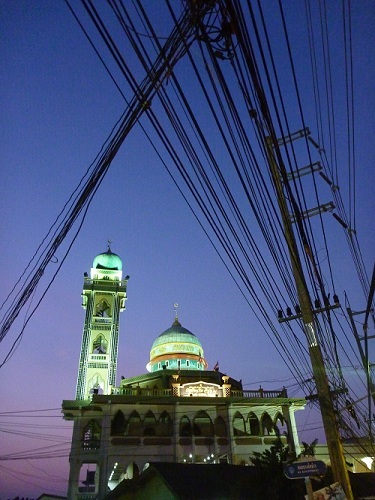 At least in South-east Asia, you lose so much more water than you think just from sweating. Riding in the 40C heat can get you feeling light-headed very quickly. If you're not having fun, you're doing something wrong. Regardless of what circumstances befall you, remember that you're on an adventure. The entire point of undertaking a long-distance motorcycle trip is to test yourself; you're obviously out of your element and the thrill of having to improvise at every turn never gets old, no matter how weary and worn-out you may be. Riding the bikes has been amazing in that regard. 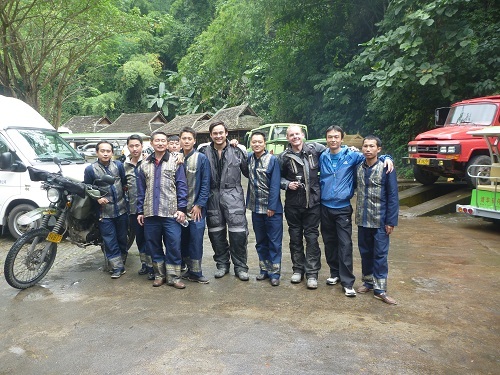 There is no better way to truly experience a culture, not just because of the ease of access granted by being off-road capable, but also because of the situations being on a motorcycle forces you into. You find yourself involuntarily thrust into conversations with everyone at every stop you make, be it for gas, water, food, or shelter. On this trip, we have already chatted (albeit mostly in grunts and wild gestures) with Buddhist monks, Lao hill-tribes, Chinese reporters, Thai transgenders, European tour groups, Australian party-boys, Burmese boatmen, and everything in between. Language and cultural barriers notwithstanding, you can see the child-like excitement the thought of such a trip brings to everybody's eyes. These are all the encounters that I will remember for years to come, and they're all the things that the tourists paying for vans miss out on. As the Thailand portion of our trip draws to a close, Peter and I eagerly await the next stop: Cambodia. If you asked me a month ago how I would feel today, I probably would have responded that I would be depleted and ready to go back. All our friends had warned us that these were the most trying times; you're far from home and still have a month to go. However, I am as excited as ever to get moving again after just picking up my brand new engine from the shop, which brings me to my last tip: be confident in yourself. Humans have the extraordinary capability to adapt and make it through the most adverse of conditions. The hardships that we have faced have all had a silver lining, everybody is amiable and always willing to extend a helping hand, and the fact that South East Asia just may be one of the most beautiful places on earth does not hurt. I am truly having the journey of a lifetime, and would encourage anybody else to take the chance. Make the time to do a trip, because you will not regret it. Many thanks to the ADV Rider and MyChinaMoto communities for all their help. Follow the Great Ride Forward on twitter at: www.twitter.com/GreatRide_Moto.